After his symphonic poem Má vlast, Smetana’s The Bartered Bride, is arguably his most popular work. The overture and dances have become standard orchestral repertoire and you can often hear the skoncná, or Dance of the Comedians from Act 3, pumped through PA systems in shopping malls and even seaside piers. 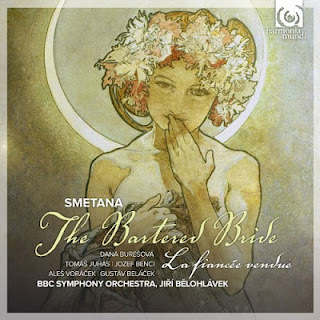 How surprising then, that after the one hundredth performance celebrations, Smetana gave vent to a big sulk - “If you think you give me any special pleasure when you praise The Bartered Bride so highly, you are quite wrong.” Whatever his reasons (he was apparently taunted by the charge that he couldn’t write anything in a light style) this bucolic comic opera, with its star-crossed lovers and marital machinations, has become his signature piece; if not all of it, then without doubt, the three energetic dances. This recording, issued by Harmonia Mundi, is taken from a live concert performance at The Barbican in May 2011, and leaves one in no doubt as to why Jirí Belohlávek has made the Czech repertoire such a splendid calling card during his tenure as Chief Conductor of the BBC Symphony Orchestra. Jirí Belohlávek is not a flamboyant conductor who has the audience stamping and cheering, but his musical integrity and love of his native music shines through every note and phrase. The effect on the orchestra and cast is truly palpable. He wisely surrounds himself with a Czech cast, who inhabit their native idiom with a natural fluency, adding greatly to the lively sparkle that prevails throughout. To Western ears, the Czech language may sound like emptying bathwater, but in indigenous hands it bounces along delightfully. This is never more so than in the rapid passages of Kecal, the scheming, bureaucratic marriage broker, sung by Jozsef Benci, whose rich, plummy bass, trips the light fantastic like a seasoned Gilbert & Sullivan patterer. And my, how he relishes his long, bottom notes, like a sonorous yawn down a storm drain. All the principal singers excel. Dana Buresová’s Marenka soars into the heavens with astounding force and clarity, her top notes ablaze with intensity. She is equally matched by Tomás Juhás as Jenik her lover. He is certainly no Wagnerian heldentenor, and there may be some who find his brittle, nasal tone a bit irritating, but in vocal terms he is the perfect foil to Dana Buresová’s hard-edged brilliance. Ales Vorácek’s performance as the naïve, stuttering simpleton Vašek, is a masterpiece of characterization, giving poignancy and depth where it is so often portrayed as caricature; his stammer is beautifully executed and very touching. However, the real accolades rest firmly on Jirí Belohlávek’s shoulders. The Bartered Bride may be a comic opera with farcical moments but it has other, darker hues as well, and getting the balance right is very tricky. Belohlávek pulls this off in spades. Much of the action occurs outside, i.e. the village green, and Belohlávek’s rhythmic drive, neither forceful nor plodding, gives everything a tangy, open-air freshness. Whilst the tender, more intimate moments are lovingly sculpted, the overall effect is one of infectious, bouncy joy. The BBC Symphony Orchestra are clearly in thrall to their outgoing Chief Conductor and play with their hearts nailed to the village May pole – never before have I heard such a penetrating, iridescent piccolo. Played in one sitting and you have a classic romantic opera-fest, performed with wit, exuberance, and great élan. With a comprehensive set of multi-lingual sleeve notes, including a full libretto, and Mucha’s whimsical 1902 painting of Claire de Lune on the cover, this 2-CD set fully justifies its top end price tag.